Visual Paradigm supports two types of positioning features: alignment and distribution which allow the positioning of selected shapes in accordance with the alignment/ distribution option through the toolbar or grouping resource icons. Alignment refers to the edges and the centers of selected shapes are aligned to each other while distribution refers to selected shapes are distributed in the same direction based on their centers or edges. Select a few model elements with the mouse on the diagram pane before executing alignment. Select Diagram > Alignment and then an alignment option from the toolbar. As a result, the alignment of all selected shapes is based on the last selected shape. Note that the last selected shape refers to the shape with no-filled selector. For turning the non-selected shape into the last selected shape, click a shape with pressing Ctrl key. When move the mouse over one of the selected shapes, grouping resource icons will be shown. 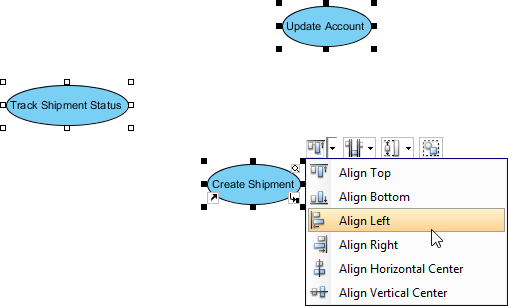 Select an alignment option from the drop-down menu of Align Top on the grouping resource icons. As a result, all selected shapes are aligned in accordance with the last selected shape. Besides aligning the shapes, shapes can also be resized through the toolbar, grouping resource icons or Align Shapes Dialog. 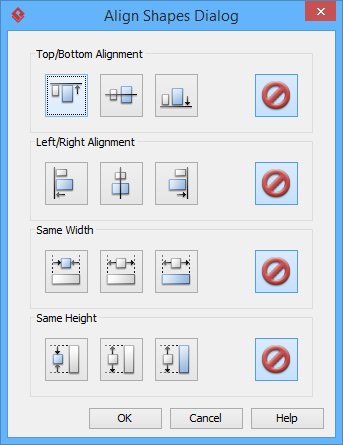 Select Diagram > Alignment and an alignment option from the toolbar. As a result, the shapes are resized. 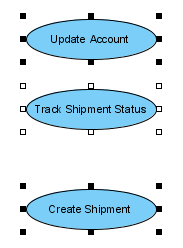 Select an option from the drop-down menu of the Same Width on grouping resource icons after select a few shapes on the diagram pane. After select a few shapes on the diagram pane, select Diagram > Alignment > Align Shapes… from the toolbar to unfold Align Shapes Dialog. You can select an option by clicking the option button directly. 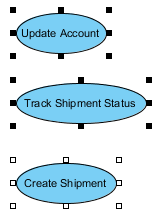 In addition, model elements can be distributed in various directions through Distribute Shapes Dialog, the toolbar or grouping resource icons. 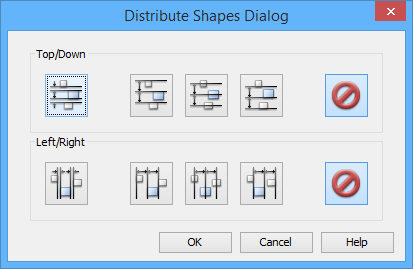 After select a few shapes on the diagram pane, select Diagram > Distribution > Distribute Shapes… from the toolbar to unfold Distribute Shapes Dialog. You can select an option by clicking the option button directly. 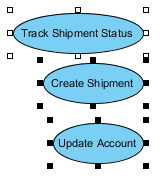 Select Diagram > Distribution and then select an distribution option from the toolbar after select a few shapes on the diagram pane. 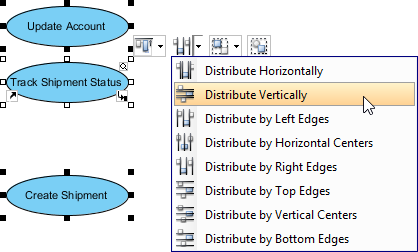 Select a distribution option from the drop-down menu of Distribute Horizontally on grouping resource icons after select a few shapes on the diagram pane.